Why is the ACE study and building resilience important for parents? In our neighborhoods, schools, grocery stores, and playgrounds, communities are important in supporting individual and family resilience. Understanding that each person’s life history impacts who they are, how they develop relationships, and how they respond to opportunities is critical in creating healthy and safe communities. What are “protective factors” for children? Read more about the Protective Factors… and in this Parent Brochure. How do young parents know what to do? The American Academy of Pediatrics offers lots of tips and information about parenting – from prenatal to young adult. Use community supports (counseling, substance abuse treatment, self-help programs, faith based groups, etc. Good relationships with family, friends or others are important. Accepting help and support from people who care about you and will listen to you strengthens resilience. Get active in civic groups, faith-based organizations or other local groups for social support. Assisting others in their time of need can benefit you as much as them. Look for your own inner strengths. Set goals and make steps to move toward them. Avoid Seeing Crises as Insurmountable Problems. You can’t change the fact that stressful events happen, but you can change how you interpret and respond to these events. Accept change as a part of living. How can I help my kids be healthy and happy? Most people who are exposed to trauma or adversity do not develop negative outcomes, hence it will be important for the field to better understand what protects them and what tips a person from being resilient to being impaired (and what can assist them in reversing this). 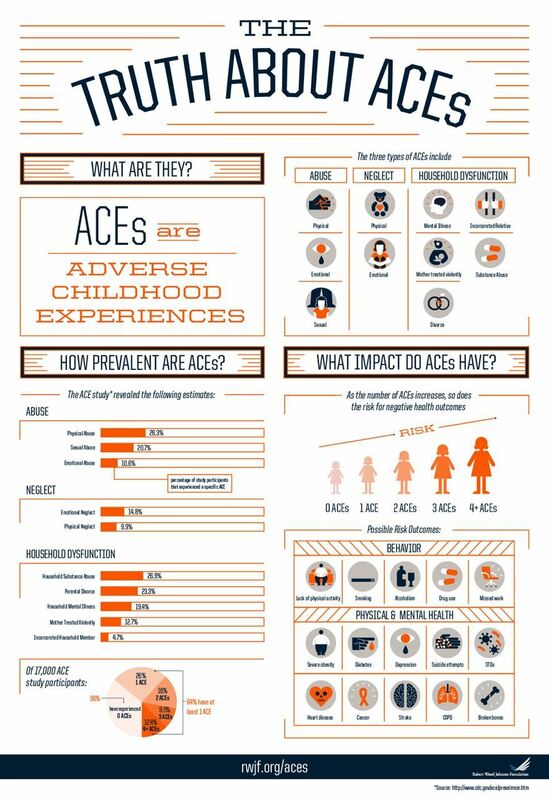 However, as the ACE studies are based on a count of adverse experience categories, rather than on how many categories still bother the individual, further research asking questions both about what was experienced and what still bothers a person is recommended to clarify this. The following table presents three stress response systems available to humans. Each may be adaptive in the short run, however, chronic activation of the first two may lead to negative health outcomes in the long run. “Fight or Flight” is the most commonly understood. The sympathetic autonomic system prepares to mobilize for action (increasing respiration, heart rate, blood pressure; releasing of adrenalin and insulin; suppressing inflammation and immune response). If fight, flight, or action are needed this can be adaptive. If prolonged, this can contribute to cardio-vascular problems, insulin elevation and resistance, autoimmune disorders, It may affect sleep, hyperarousal, anxiety, depression, and motivate unhealthy coping. “Freeze” is a backup strategy, if fight/flight is not successful or available (e.g. for weaker ages, gender, or situations). The body immobilizes, may feel numb, or may dissociate. In the short run this may be adaptive, but if too intense (shock) or chronic (helpless) this can also be costly for the body or motivate unhealthy coping. Social Engagement (or “be Friend”) is recently receiving attention. It involves the parasympathetic autonomic system and is associated with health maintenance and using social communication and problem-solving to deal with stress. This system can dampen ‘fight or flight’ and inhibit ‘freeze’, decreasing their negative effects. It can contribute to resilient functioning and health maintenance. Within pregnancy and the early years after birth, the brain structures and connections for dealing with stress are built in part by physical development and partly through practice—we “use it or lose it”—and what we use depends on our environment. Children exposed to adversity are likely to practice fight/flight/freeze reactions and build brains that are ‘on alert’ for danger, quick to react behaviorally and emotionally, and less likely to think ahead about choices and consequences or engage socially in problem-solving. The brain chemicals that prepare for stress response in the short run (e.g. cortisol) can be toxic over the long run, interfering with development of brain regions. Traumatic stress may overwhelm memory systems for danger and safety, making it difficult to learn from experience, failing to isolate past from present experience (flashbacks), etc. Chronic activation of the fight/flight system (being “bothered”) may result in chronic obstructive pulmonary disorder, coronary artery disease, insulin-related problems (diabetes), autoimmune disorders, cancer, etc. Research estimates that chronic or cumulative stress may shorten one’s lifespan by nearly twenty years. What it may look like in children: Children may have difficulty regulating mood and behavior, be irritable or aggressive, be anxious or withdrawn, show growth delay, experience sleep difficulty and deprivation, have difficulty managing social interaction, have difficulty with attention control, etc.—which may interfere with attachment, social competence, and academic achievement that could otherwise serve as protective factors and support resilience development. This may lead to inappropriate or excessive psychiatric medication or to self- medication with substance use. How we see and think about ourselves and the world includes expectations about safety, confidence, self- esteem, and meaningfulness. ACEs can undermine or overwhelm these expectations, leaving us feeling chronically unsafe, hopeless, helpless, shamed, etc. Thoughts may focus on life being unfair, meaningless, and unforgivable. When these expectations about self and others continue into adulthood, the stress responses at the neurological, biological, and social levels are perpetuated. The relationship between ACEs and alcohol, nicotine, and substance abuse indicates that dependence is not just the result of biological exposure to an addictive substance. Reorganizing incorrect thoughts and expectations may reduce stress and promotion of resilience expectations may protect against stress. What it may look like in children: Children may wrongly conclude from ACEs that they are at fault or that the scope or longevity of problems will be catastrophic, and feel ashamed, anxious, helpless, depressed, angry, etc. They may learn to avoid situations that upset them, interrupting social competence development or derailing maturation. Even as they do gain greater competence, they may fail to update these expectations and, as a result, may carry them into adulthood. Before developing language, infants and toddlers may experience and remember trauma non-verbally. They may develop a self-image or sense of competence consistent with fight/flight/freeze coping which could be self-fulfilling and interfere with prosocial personality development. Children may develop dissociative responses (e.g. shifting between different roles or personalities) that are protective, but which complicate social interaction, learning and maturing. In relation to parents who struggle with their own trauma histories, children may develop disorganized or insecure attachments. Children who experience adversity or victimization are more likely to encounter social environments that can multiply stressful interactions. Their fight/flight/freeze stress responses are likely to be misinterpreted by others in social settings as misbehavior rather than as attempts to cope; such that they encounter discipline rather than support. They may fail to develop social competence that could protect them from further trauma. Their families may be affected by the ACEs in ways that interfere with their ability to protect and promote resilience in children. What it may look like in children: Children with ACEs may be picked on or may emerge as bullies. Although discipline may be ineffective in managing stress responses, they may experience multiple encounters with punishment before being excluded from academic or social settings. Children may be separated from families, placed in foster care, and though physically safe may feel psychologically unsafe and have difficulty regaining a sense of well-being and permanence; contributing to a chronic stress response. They may experience multiple caregivers across foster or kinship care. They may seek out inappropriate company, become exposed to substance abuse or illegal activity, etc. Families and community settings may struggle to deal with their extra- ordinary needs, associated with ACE exposure. From a lecture at Parents as Teachers National Conference, 4-5-07.